Select Neck Measurement Select Neck Measurement 6" 6.5" 7" 7.5" 8" 8.5" 9" 9.5" 10" 10.5" 11" 11.5" 12" 12.5" 13" 13.5" 14" 14.5" 15" 15.5" 16" 16.5" 17" 17.5" 18" 18.5" 19" 19.5" 20" 20.5" 21" 21.5" 22" 22.5" 23" 23.5" 24" 24.5" 25" 25.5" 26" 26.5" 27" 27.5" 28" 28.5" 29" 29.5" 30"
Select Length Select Length 8" 8.5" 9" 9.5" 10" 10.5" 11" 11.5" 12" 12.5" 13" 13.5" 14" 14.5" 15" 15.5" 16" 16.5" 17" 17.5" 18" 18.5" 19" 19.5" 20" 20.5" 21" 21.5" 22" 22.5" 23" 23.5" 24" 24.5" 25" 25.5" 26"
This Hug-A-Dog Harness® Coat meets three needs in one: a walking harness, a warm, fleece-lined coat, and superior water, ice, and snow protection. 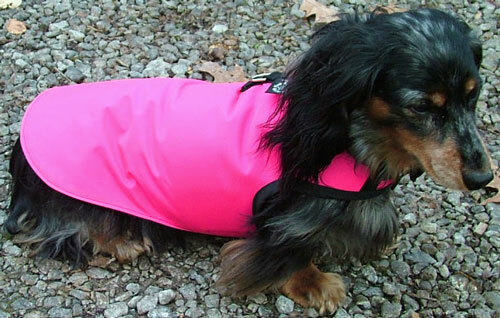 The same quality and durability as our regular solid fabric harness, the coat version covers more dog. 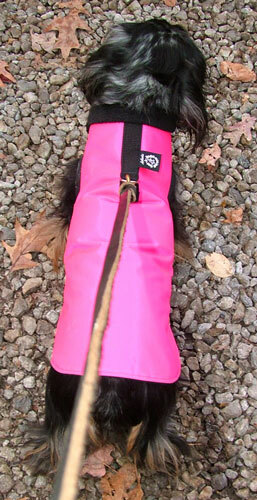 Polar fleece lined on the inside for warmth, and a water-resistant outer lining to keep your dog dry. Easy to put on with hook & loop closures (like Velcro®) at the chest and below the neck; includes a safety clasp on the neck closure. No straps to rub under the arm pits. Transfers pulling pressure to chest area. Machine washable. Prices starting from $52.95, based on chest measurement. PLEASE MEASURE CAREFULLY. THERE IS A $7 EXCHANGE FEE FOR REPLACING A COAT RETURNED DUE TO INCORRECT MEASUREMENTS. All Hug-A-Dog products are custom-made on order. Please allow 2-3 weeks for delivery. 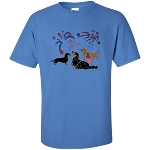 This is the 4th item we have bought from Doxie Delights. We have the customer harnesses for our dogs!! 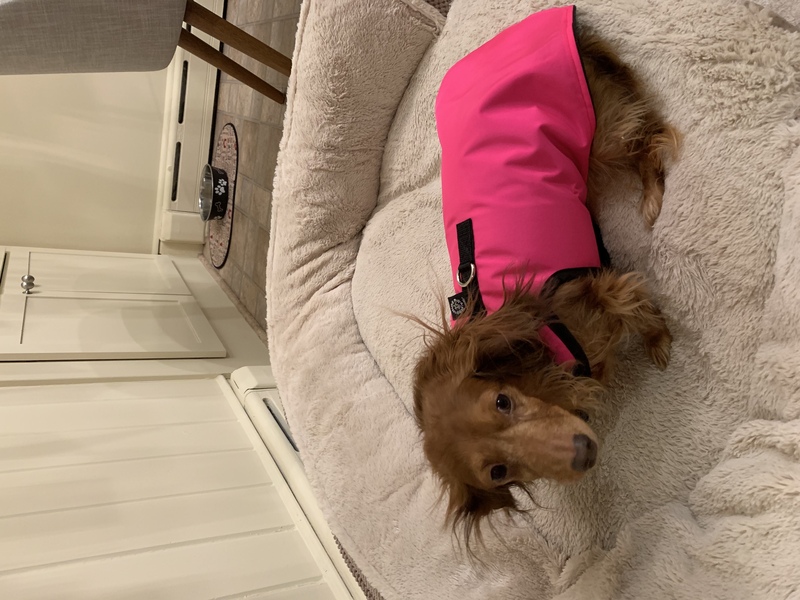 We decided that our one doxie needed this coat with the leash hook since he had back surgery, he needs to be on a lease in the backyard and in the winter/rain it was very difficult to use the original harness over his winter coat. This was the perfect solution !!! He loves it and so do we !!! Perfectly made for him and very high quality materials!! This little coat is perfect for our current weather. After 4 years of drought we are finally getting a lot of rain but the daytime temp rarely gets lower than the low 50's. I have other sweaters and jackets, but what I especially like about this one is that the velcro closure under her tummy keeps the jacket in place so that she cannot wiggle out of it. 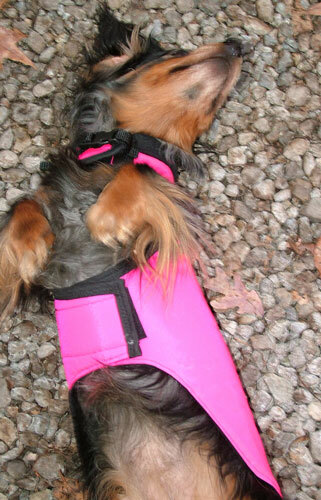 This is our 3rd Hug-A-Dog Harness, though our first full coat version. It definitely does the job of keeping our moxie warm when the temperature drops below 50 degrees. The best thing is that this harness offers the warmth and protection of a coat, but still has the "D" ring function of the short harness. Very well made, and stylish! Purchased this harness/coat for our doxie, Winston and it is absolutely perfect. It keeps him warm and dry and it is so easy to put on. Our dog walker loves this as well as its incredibly convenient. The coat is made with attention to every single detail. Like each of the products we have purchased from Dachshund Delights over the last 20+ years, this is extraordinarily well made and I have no doubt it will last decades, literally! We get so many compliments on this harness/coat. Its very sharp and looks great! We got Burgundy outer, black fleece and a gray reflector stripe. Looks fantastic. Unfortunately, we waited too long to order this, & the weather warmed up too much to be able to use this this spring, , but we are looking forward to next winter. We ordered the Hug-A-Dog™ Ear Coozie to go with the coat as an option to keep the neck area warm ( the coat neck is cut lower) & it works perfectly. Also I love that this coat combines a coat & harness, so you can just clip your leash to the d ring on the back on the coat. I cant say enough about the Hug a Dog products, they are fantastic quality, functional, look great, lots of color options, fit great & you get all this for a very reasonable price!! 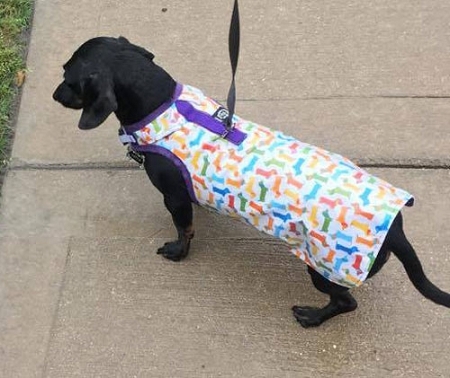 Our rescued 10 year old dachshund, Gunner, loves to wear his warm, water resistant coat when he goes out in the cold and drizzle. Instructions to measure were easy to follow and the coat fits perfectly! We chose the red fabric with silver trim and if we put a number on the side he would look like an Ohio State football player. It's fun to let other folks know where we're from while we winter in the south. This is my second purchase of the waterproof coat. This version has a thicker nylon, which I like. The prior version was ok but snagged and didn't keep its shape as well. This version also is angled a bit near the end towards the dog's tail, which keeps the coat flatter against the dog's body. The prior version tended to flare out. 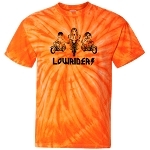 I ordered the high-visibility orange and yellow, which really stand out. I have mini Dachshunds so I like that they are visible to cars, etc. The tailoring is top notch. 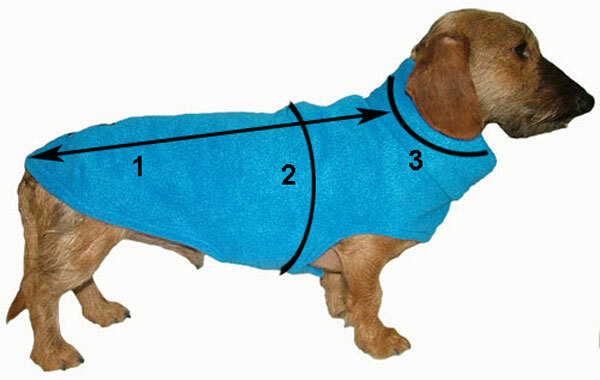 If you are careful with measuring your dog, the coat will fit perfectly. This coat was perfect for Boston’s harsh weather. We wanted a coat that also functioned as a harness but was also warm. It’s well made and the customer service was amazing. They made sure we got the measurements just right. I recommend! 3) around the base of the neck. Copyright 2018 2Doodles LLC, dba Dachshund Delights. All rights reserved.